Much of my interest in reflecting on this event has largely to do with my research – and, in particular, the fact an analysis of the Heritage Classic was my first major published research project. I remain very proud of this paper, and I think it holds up very well. You could also say that with the passage of time, now that I am comfortably ensconced at a research university, remembering this event has made me a bit nostalgic for my days as a doctoral student. Certainly an unexpected nostalgia, but one that certainly happened for me while thinking about the ol’ HC this week. 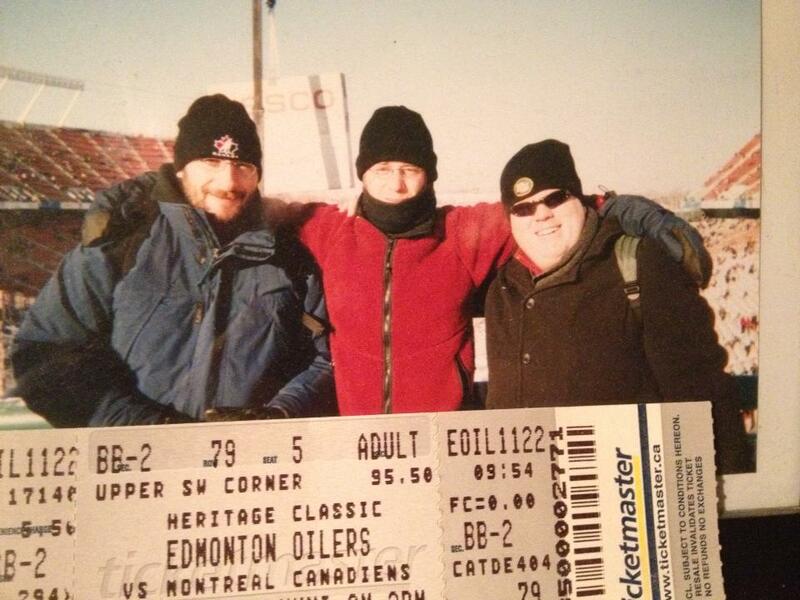 In any case, I have been writing a research note about the impact and legacy of the Heritage Classic ten years on. To summarize – I think it was a very successful event, in large part because it came about at the right time. However, there has been little long-term local impact and that the template it created for the many, many, many outdoor events since have largely eliminated any of the broader cultural or emotional impacts. In short, good event that’s been emulated far too often and, as such, its legacy is a bit tarnished. The thing I will remember most about that day is not the cold, not the games, not even Gretzky skating out onto the quintessential Canadian landscape wearing his beautiful blue Oilers jersey. Rather, I will remember my first glimpse of the rink – taken just before this photo – and my friend Terry saying to me, “Tomorrow, you are a researcher. Today, you are 12 years-old.” And for that day, I absolutely felt like a kid again. By Gregory Ramshaw in Uncategorized on November 22, 2013 .